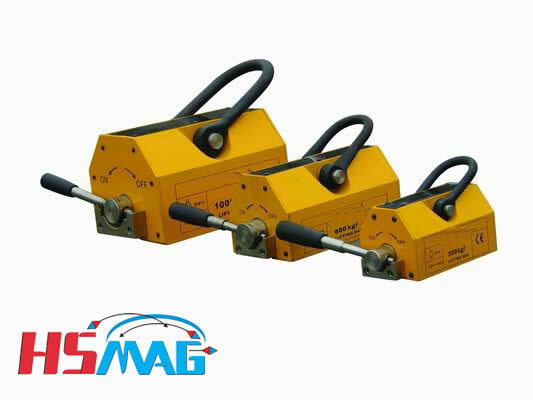 PML Handling Lifting magnets have proven many times. They have an increased Safety factor and will reach the best Results possible especially at poor surfaces. The robust, smooth Handed switching mechanism can be operated with Gloves as well, and can be turned off recoilless. The massive method of construction of the PML series and the especially strong running rotor shaft ensure reliability, even in harsh applications. PML Lifting magnets are available in many different designs and versions. All types are for broadband use, with special values for different core tasks. They provide more safety. A lot of arguments speak for their commitment both in toolmaking and in steel construction, material storage etc. Designed for performance and longevity, HSMAG’s Permanent Lifting Magnets are also very distinctive in style. Smaller is not always better and especially in relation to below the hook lifting. Our unique permanent lifters have a larger footprint than most other lifters on the market. Having this larger footprint makes it easier for the user to center the magnetic lifter onto the load which in turn is better for the overall balancing of the lift.These lifters employ the latest rare-earth magnets for unsurpassed power and performance. They are capable of lifting both flat and round work pieces safely and can be customized to suit a variety of applications.Three standard sizes are available in the following safe working loads — 500, 1000 and 2000 lb. — to best fit your light and heavy lifting needs.